Around the world, threats to densely populated locations such as subways, train stations and airports underscore the need for new counterterrorism methods – especially the capability to investigate suspicious objects that may contain weapons or hazardous materials. Airbus Defense and Space, Inc. recently hosted a successful demonstration of its SONEX-P threat detection system to representatives of major international airports, homeland security agencies, and federal, state, and local law enforcement organizations. Attendees included representatives of the Metropolitan Washington Airports Authority, Pennsylvania State Police, Virginia State Police, and the Domestic Nuclear Defeat Organization. During the demonstration, which was held at the Airbus Group storage facility, SONEX-P accurately detected and identified a range of hidden explosive threats — each in a single scan. What sets SONEX-P apart is its combination of neutron technology with 3D imaging, enabling faster threat detection and more accurate views of a threat compared to X-ray based detection devices. The system’s 3D imaging capability and laptop interface allows first responders to interrogate suspicious packages from a safe distance without handling them. The system software is fully customizable and can be optimized to detect other emerging chemical, nuclear and radiological threats. Easy to use, SONEX-P also eliminates the need for lengthy training to interpret readings. The device does all the work — signaling a live threat with a red light on its console and a non-threat condition with a green light. Weighing about 50 pounds, SONEX-P is lightweight, and comprised of only two elements — a man-portable detection head and a companion laptop computer — that work in tandem to identify, detect and discriminate chemical, radiological, nuclear or explosive threats located in parcels, luggage, ordnance or abandoned bags. 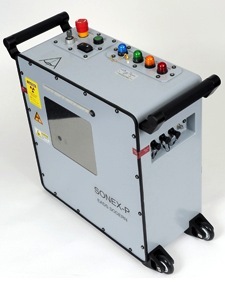 SONEX-P contains an automatic neutron interrogation-based solution that indicates in as little as 90 seconds whether or not chemical, radiological, nuclear or explosive material is hidden in a parcel or unexploded ordnance. As an innovative unit, SONEX-P has a range of features that set it apart from current detection methods. Most notably is its ability to automatically identify, detect and discriminate chemical, radiological and explosive threats with a single scan, enhancing the overall accuracy rate and saving valuable time in critical situations. SONEX-P is a highly portable system designed for use by a single operator. This is due to the system’s compact size (18 in. x 20 in. x 7 in. ), total weight of 50 lbs., and a user-friendly interface tailored especially for homeland security applications. The detection head is easily moved and manipulated by a single operator. Unlike other devices, SONEX-P utilizes an electrical neutron generator, eliminating the need for neutron source isotopes to accurately detect explosive or hazardous materials. As a result, this system is not subject to International Atomic Energy Agency regulations concerning the transport of radioactive isotopes. This enables it to travel to countries where the importation of devices with radioactive material might be problematic. SONEX-P even can be flown on a commercial aircraft as checked baggage in accordance with local regulations. The system has a separate algorithm for law enforcement, homeland security and first responders who deal with suspicious packages, abandoned bags and non-ordnance explosive threats. Leveraging its high flexibility, SONEX-P can operate on local electricity or two standard MILSPEC BB-2590 rechargeable lithium ion batteries, the latter of which can power the device for 24 hours on a single charge. This allows it to be deployed in support of a wide range of operations, including those in austere environments. Its software interface package can be installed on any Windows-compatible laptop – including such rugged notebooks as the Dell Latitude E6400 XFR – which can interface with the SONEX-P device through a shielded, OEM-supplied ethernet cable link. Wireless communication is available as a customer-ordered option.